WHERE: Meet at Dorothy Quincy Adams House on Butler Rd. at 9:00 am. 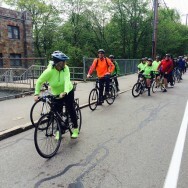 ROUTE: A relaxed ride viewing a number of historical sites in Quincy. We will take a break for coffee and donuts at Donut King in West Quincy. Please review our Ride Guidelines prior to the ride.